Learn how to Transfer Music from iTouch 1 to iPhone 5. 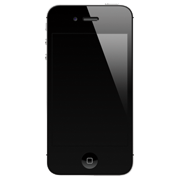 Find iMobie experts advice on Music from iTouch 1 to iPhone 5 with ease. Dear Sir and Madam at iMobie. Thank you in advance for your help! So all my music is on my computer and iTouch 1...well...I just got dumped...and my ex-boyfriend is taking the computer. Is there any way to transfer music from iPod touch to iPhone 5 which I'm going to buy and I don't have to start all over? As in the near future, it's not likely for me to invest a new computer, so I have to do this (transfer music from iTouch 1 to iPhone 5) on my friends' cmoputer. Is it possible? If your iPhone/iPod/iPad is regularly managed by iTunes, you are able to transfer music onto iPhone 5 easily by sync. But if you want to transfer music from iTouch 1 to iPhone 5 on the fly, you have to appeal to a third party application for this problem. 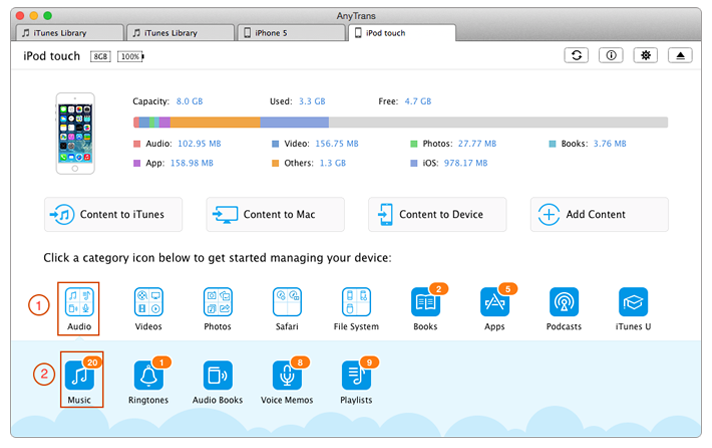 In this iMobie Guide, we will show you how to transfer music from iTouch 1 to iPhone 5 with one single click. Check it out. AnyTrans can always work through annoying iTunes limits, to transfer music from iTouch 1 to iPhone 5 is just one example. 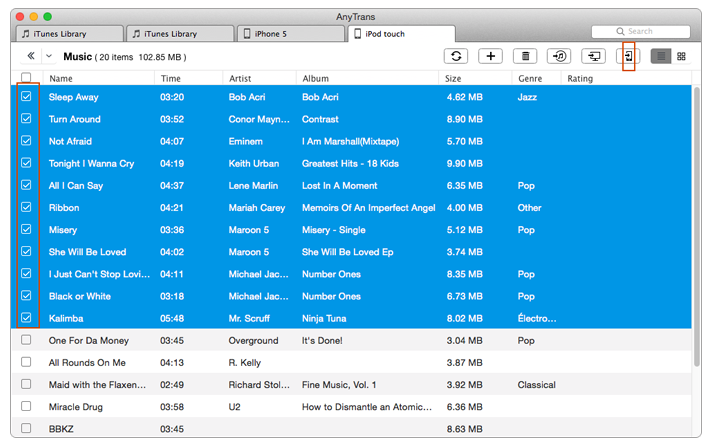 Thanks to Drag-and-drop interface and with Wi-Fi supported, AnyTrans is the ideal music Transfer application for both naive and experienced users. 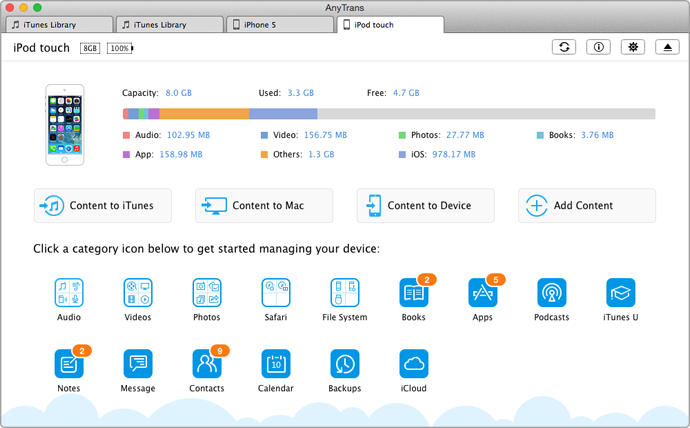 Below are 1-2-3 steps that show you how to transfer files over multiple Apple devices. Click on "Audio" button and select "Music" to enter the manage page on the homepage of AnyTrans. Highlight the music files you choosed and click To Device option (Shortcut: Right click the mouse and select To Device). Then you can leave it alone and AnyTrans will auto transfer music from iTouch 1 to iPhone 5.